The eye's lens is a transparent structure that focuses images on the light-sensitive retina. 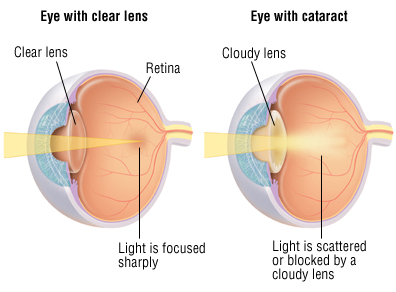 Cataracts are cloudy areas in the lens. They occur when certain proteins in the lens form abnormal clumps. These clumps gradually get larger and interfere with vision. They distort or block the passage of light through the lens. "Cataract" means "huge waterfall" or "enormous downpour," which is how some people describe their clouded sight, like trying to look through a waterfall. In many cases, cataracts are age-related. They first appear in the 40s or 50s, but may not affect vision until after age 60. In other cases, cataracts may be caused by eye trauma, long-term diabetes, corticosteroid medications, or radiation treatments. In infants, cataracts can be present since birth (congenital) or can occur as a result of an infection that happened during pregnancy, especially toxoplasmosis, cytomegalovirus, syphilis, rubella, or herpes simplex. In infants and young children, cataracts also can be one symptom of a disease that affects how the body processes carbohydrates, amino acids, calcium or copper.